Had a day up at the lake. "The Point" as it's been called all our lives. This time I did not have any cooking and washing responsibilities, so it was pure relaxation. I enjoy cooking up there too, but appreciated the break from routine this time. 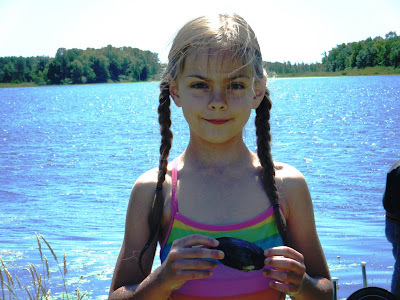 Little Ellie spent much of her time foraging for mollusks. Little Isaac spent most of his time fishing. Ellie joined him later. 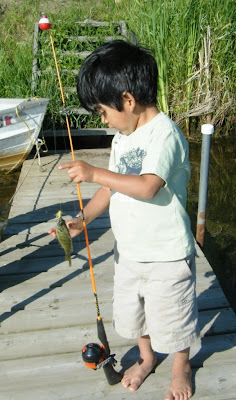 Both kids could bait their own hooks with worms and fished right off the dock. They had a blast. Daddy and I helped by removing the fish from the hooks, otherwise the kids managed themselves while we relaxed. By the end of the afternoon they caught enough tiny panfish for a meal for them. (Daddy was so sweet to filet those tiny pieces that night when we got home!) I was a bit envious since I really enjoy a good fried crappie. I love summer afternoons at the lake. Summer time looks like fun at the lake.